Plans to offer mobile phone coverage on the London Underground have been derailed because of high costs. Talks between Chinese telecoms provider Huawei and the UK's operators have broken down. 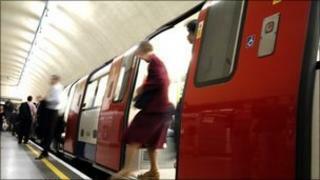 They had agreed to examine the idea of getting coverage on the tube in time for the London 2012 Olympics. But putting antennas throughout the Tube's antiquated network has proved too costly. "As a group we will continue to positively explore all other avenues available to us in order to provide a service at a later date," they said in a joint statement. Vodafone, O2, Everything Everywhere and Three are believed to have already spent several million pounds on the project. Huawei had offered to donate some of the necessary equipment. "We are grateful to the companies who explored the possibility of getting full mobile coverage on the Tube, although disappointed that the genuine problems encountered could not be overcome on this occasion," a statement from the Mayor of London said. Plans to expand wi-fi coverage on Tube stations will continue.